Forget clubbing, couch-surfing, and selfie sticks. The 2018 ITB Berlin Youth Travel Hall (4.1) showed off what the youth travel market is really about – experiential and immersive travel for key players in tourism for development. 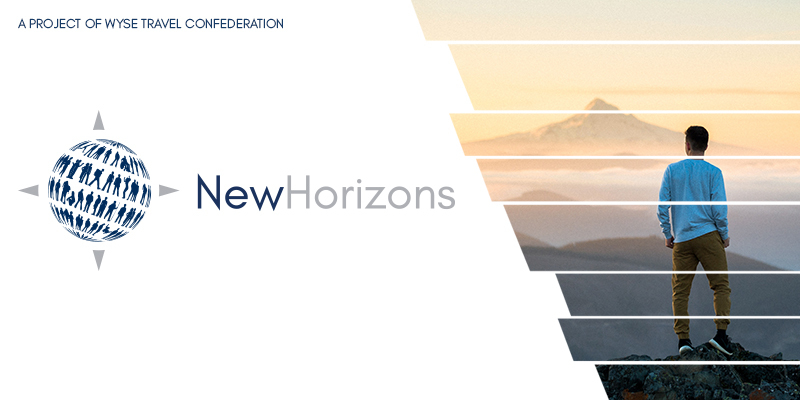 From the Hall 4.1 Main Stage, the World Youth and Student Educational (WYSE) Travel Confederation delivered insights from the New Horizons Survey. The survey of 57,000 travellers ages 18-35 worldwide offers the industry’s most comprehensive look into youth and student travellers. Youth accounted for at least 23% of the 1.3 billion international arrivals in 2017. 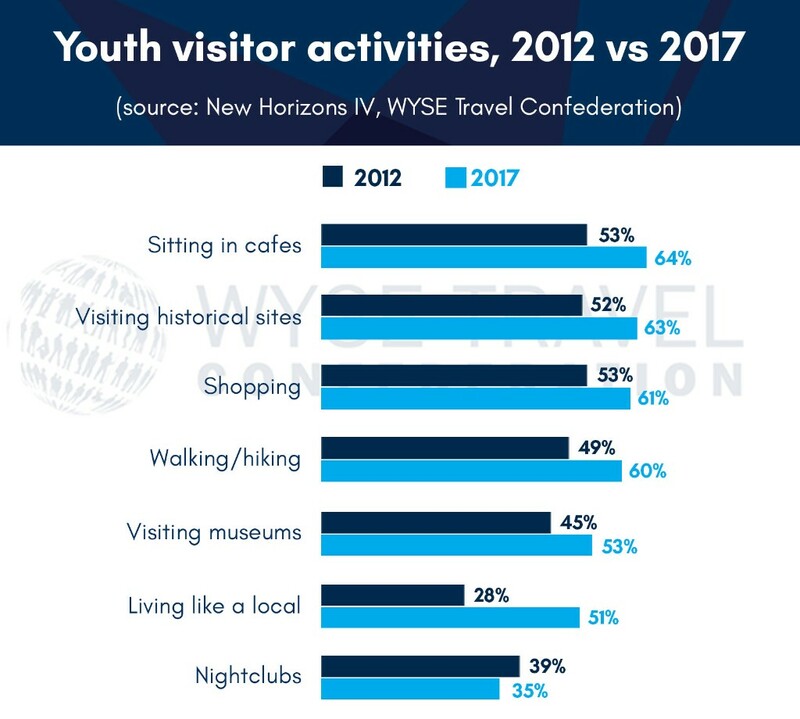 Since WYSE Travel Confederation first conducted the New Horizons Survey in 2002, average youth trip spend has more than doubled. According to WYSE Travel Confederation estimates, youth generated about $280 billion in tourism receipts in 2016. Young travellers tend to stay longer and spend more than a typical, traditional tourist. While in the destination, they prefer visiting cafes and restaurants, historical sites, and shopping. The concept of ‘living like a local’ also surged ahead from 2012, with more than half of respondents (51%) now indicating this is a desired activity. While the top destinations benefiting from Millennial and GenZ travel spend haven’t changed much in recent years, the New Horizons Survey has revealed some significant shifts. 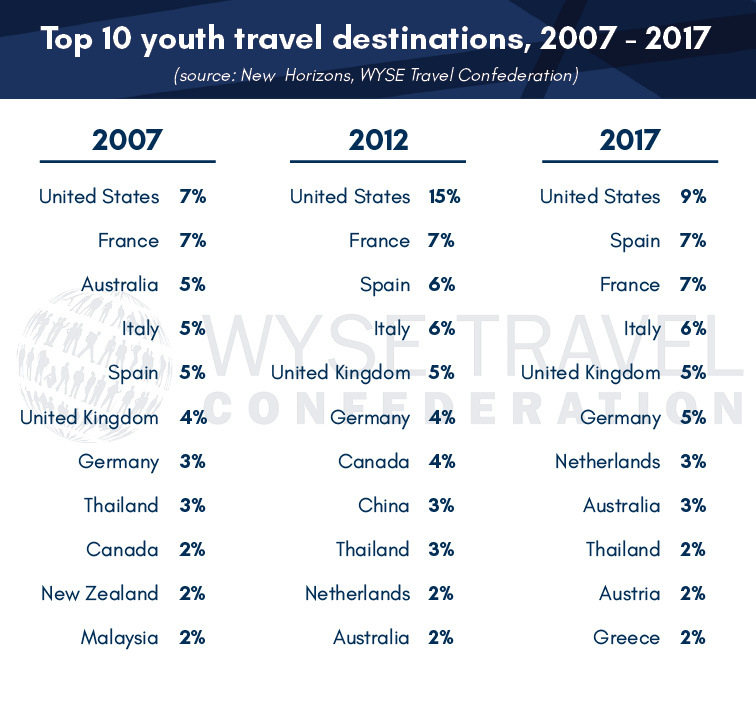 The United States is still at the top of the list for young travellers, but it has lost some of its share of the pie. Spain is now the second leading destination and Australia moved back into the top 10 for the first time since 2007. “We have worked closely with our destination members as they’ve tapped into this valuable travel market – one which stays longer, spends more, and are the most likely to return to the country later in life, with family and friends,” said WYSE Travel Confederation Director General David Chapman. WYSE Travel Confederation member Fáilte Ireland is one destination that has used WYSE’s youth traveller insights to develop their destination marketing, capitalise on their existing assets, and influence young travellers to experience Ireland beyond the city centres. The Ireland exhibition stand took up a prominent space beside the WYSE Village in Hall 4.1 for showcasing their three signature brands: Ireland’s Ancient East, Wild Atlantic Way, and Dublin, Breath of Fresh Air. The New Horizons Survey has consistently found that top motivations to travel for young people are to explore other cultures, experience everyday life in other places, and increase their knowledge. Millennial and GenZ travellers are not only lucrative for destinations, but they’re also the market that is ready, and willing, to fully embrace sustainable travel. “Youth are pioneers and trendsetters. They attract others to new destinations and places that are off the beaten track. Destinations that aren’t tapping into the power of youth travel are simply missing out,” said Chapman.